Using needle and thread sew a button on one end of the boot topper. Then, button the boot topper on your boots! This entry was posted on Tuesday, February 12th, 2013 at 12:00 AM by Emilee Gettle	and is filed under Free Crochet Patterns. You can follow any responses to this entry through the RSS 2.0 feed. You can skip to the end and leave a response. Pinging is currently not allowed. 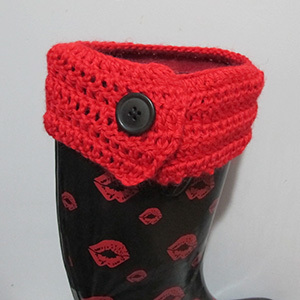 Back in the fall, I made 3 pairsof boot cuffs (as we call them) for some of my girls. Daughter-in-law, 2 grand-daughters and a granddaughter-in-law. Each girl had a crocheted one with a large wooden button on the side that faces out. They have been stopped and questioned about the boot cuffs practically everywhere they wear them. This one is a bit different. So, I think 4 more boot cuffs are in order. Maybe 5 since I have another granddaughter who wants a pair. How do they stay up on the boots from slipping down or off when you are walking?? Hi Rachel,Thank you for all patterns your design are so pretty.